Mario Stanić was one of the most versatile players in Croatian history. A real offensive all-rounder playing on all positions up front. He started as a striker but later played mostly as right midfielder putting all his efforts in team success showing amazing commitment to his teams. That's why I always apreciated him as well as the all other similar players. It's hard to speak about his characteristics because he was good in everything. First of all he had great leap which provided him many headed goals. He was strong and fast, very endurable player. Stanić also had good technique and dribbling skills, sometimes making great tricks, but most of all he had "nose for goal" what resulted in goals even when he played in midfield. Sadly Mario Stanić's carrer was destroyed by numerous injuries. He started his career with Željezničar Sarajevo. He was considered to be one of the most talented young players in former Yugoslavia. 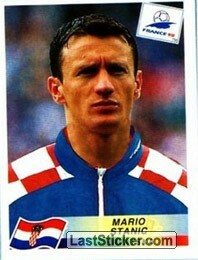 In 1992, war began and he went to Croatia, where he played for Dinamo Zagreb. After only one season, he moved to Spanish Sporting de Gijón, and year later to S.L. Benfica in Portugal. In 1995 he arrived at Club Brugge and was top scorer of the Belgian First Division that year with 20 goals. Then Parma bought him in late 1996 and he played four seasons with that side. He was then transferred to Chelsea in 2000. He won 49 international caps and scored seven goals for the Croatian national team between 1995 and 2003, making his international debut in a Euro 1996 qualifier against Estonia in September 1995. He made three appearances for Croatia at the Euro 1996 finals in England and went on to appear in all of the team's seven matches at the 1998 FIFA World Cup finals in France, where they won the bronze medal. At the latter tournament, he scored Croatia's first-ever World Cup goal in their opening 3-1 victory over Jamaica and assisted in Robert Jarni's opening goal in their 3-0 victory over Germany in the quarterfinals. Stanić also made two appearances for Croatia at the 2002 FIFA World Cup finals as a second-half substitute, only to see Croatia fall short of qualifying for the second round of the tournament. His last international appearance came in April 2003 as a half-time substitute in a friendly match against Sweden. He was forced to retire at the age of 32 after developing a serious knee injury during the 2003-04 league season. One of the most famous moments of his carrer was his spectacular 35 meters volley goal on his Chelsea debut. It's in first link down.